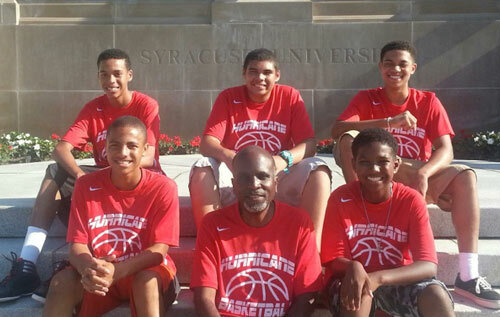 Five of Team Hurricane Basketball Programme’s most promising players have returned home from famed coach Jim Boeheim’s Basketball camp at Syracuse University, New York. Bermuda student-athletes, Zachary Johnson, Mykal Glasgow, Kumari Tannock, Jorel Smith and Jacy Lowery were put through their paces as they continued their basketball education. Team Hurricane founder and head coach Doug Reed is a graduate of the University. “I loved reliving my college experience through the boys, watching them walk along the same paths I did across campus and seeing them adjust to life in the dorm,” he said in a press release. Boeheim is currently second on the wins list of Men’s NCAA Division I coaches with 948. And he spoke to the group to offer encourgement and emphazise the need for a strong work ethic. The Syracuse University trip was Team Hurricane’s first overseas basketball experience — and Reed believes this will hugely benefit the group. “This week’s camp experience showed me how the sport of basketball has grown in Bermuda. “All of our boys played very well and showed that they possess the skill and ability to compete at this level and with players from the United States and beyond. Out of the 600 campers, our very own Kumari Tannock was selected as an Allstar in the NCAA Division. “Our programme’s next step is to have our players add an amount of aggressiveness to match their skill level. “Our players are by no means passive, nor do they back down. In fact our boys, as a reflective of the Team Hurricane Basketball Program, are extremely competitive and play spirited basketball.